Her married name was Hardman. Elizabeth Ann Garner was born circa 1896. Elizabeth Ann Garner was also known as Annie. Elsie (#3) states Annie had a brother George who was killed in the First World War. She married Daniel Hardman, son of Daniel Hardman and Ellen Morris, before 1922 at Lowe House Catholic Church, North Road, St Helens, Lancashire. Elizabeth Ann Garner died in 1962 at Providence Hospital, St Helens, Lancashire. She was buried at St Helens Cemetary, Hard Lane, St Helens, Lancashire. Marriage* She married Daniel Hardman, son of Daniel Hardman and Ellen Morris, before 1922 at Lowe House Catholic Church, North Road, St Helens, Lancashire. Her married name was Wainwright. Martha Hardman was born on 29 July 1891 at 67 Peckers Hill Rd, Sutton, St Helens, Lancashire. Martha maybe stayed at home to look after her parents as Elsie (#3) can't recall her working. She also went to look after her husband to be's mother in Earlestown. She lived there where William also lived at the time after losing his first wife. They later married and moved back to Sutton. 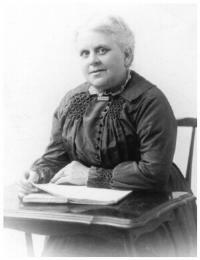 She witnessed the marriage of Henry Chaulk and Elizabeth Ann Hardman on 22 April 1916 at The Wesleyan Chapel, Sutton Road, Sutton, St Helens, Lancashire; At the time of the marriage Henry was a labourer at the wagon works in Earlestown and was living at 20 Houghton Street, Earlestown. Elizabeth was living at 75 Peckers Hill Road, Sutton. Martha Hardman married William Stanley Wainwright, son of ? ?, circa 1932 at Brunswick Methodist Church, Earlestown, Lancashire. Martha Hardman died on 9 May 1974 at 75 Peckers Hill Rd, St Helens, Lancashire, at age 82. She was buried at St Helens Crematorium, Lancashire. Marriage* She married William Stanley Wainwright, son of ? ?, circa 1932 at Brunswick Methodist Church, Earlestown, Lancashire. William Stanley Wainwright was born circa 1893. He married Martha Hardman, daughter of Daniel Hardman and Ellen Morris, circa 1932 at Brunswick Methodist Church, Earlestown, Lancashire. William and Martha had no children. William Stanley Wainwright died in September 1974 at St Helens Hospital, Lancashire. He was buried at St Helens Crematorium, St Helens, Lancashire. He lived on Baxters Lane, Sutton when he was married, next to Biscuit Works where his wife worked. James Hardman was a collier. He married Annie (?). Margaret Hardman was born before 1917. Margaret never married. In 1996 she was still living at 116 Robins Lane with Nelly (Ellen) her sister. Margaret worked in United Glass Bottles canteen. Elizabeth never married and lived with her other two sisters. She worked at a Macintosh factory in Rainhill. Ellen Hardman also went by the name of Nelly. She was born circa 1914. In 1996 she was still living with her sister Margaret at 116 Robins Lane. she worked at the shirt factory around Chapel Street, St Helens and later worked Tootels in Parr (clothing makers). 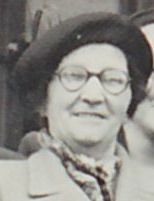 Frederick Hardman married Ethel Stockton. George Hardman was born on 12 November 1922 at 75 Peckers Hill Rd, St Helens, Lancashire. He was baptised at St Anns Church, Sutton, St Helens, Lancashire. 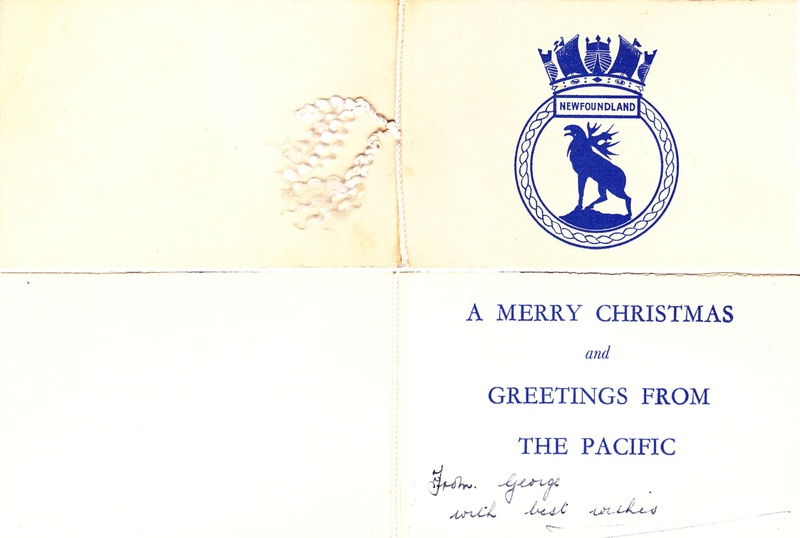 George was in the Navy and a Articifer Petty Officer on the Newfoundland. He watched the attack on Pearl Harbour from his ship. HMS Newfoundland was built by Swan Hunter and launched 19 December 1941 by the wife of the then British Minister of Labour, Ernest Bevin. The ship was completed and commissioned in December 1942. After commissioning Newfoundland joined the 10th Cruiser Squadron, Home Fleet. Early in 1943 the ship became flagship of the 15th Cruiser Squadron, Mediterranean. On 23 July 1943, during the Sicily Campaign, she was torpedoed , either by the Italian submarine Ascianghi or U-407. Temporary repairs were carried out at Malta. Later, steering by her propellers only, she steamed to the Boston Navy Yard for major repairs. In 1944 the ship was re-commissioned for service in the Far East. While at Alexandria an exploding air vessel occurred in one of the torpdoes in the port tubes which caused severe damage and one casualty. The repairs delayed her arrival in the Far East for service with the British Pacific Fleet (BPF). Newfoundland went to New Guinea to support the Australian 6th Division in the Aitape-Wewak campaign. On 14 June 1945, as part of a BPF task group, Newfoundland attacked the major Japanese naval base at Truk, in the Caroline Islands. On 6 July Newfoundland left the forward base of Manus in the Admiralty Islands with other ships of the BPF to take part in the Allied campaign against the Japanese home islands. On 9 August she took part in a bombardment of the Japanese city of Kamaishi. Newfoundland was part of a British Empire force which took control of the naval base at Yokosuka. The ship was present in Tokyo Bay when the Instrument of Surrender was signed aboard the USS Missouri, on 2 September 1945. Newfoundland was then assigned the task of repatriating British Empire prisoners of war. She returned to Great Britain in December 1946. George was later an electrician at Beechams. He married Agnes Featherstone in 1954 at Lowe House Catholic Church, North Road, St Helens, Lancashire. George Hardman died in 2002. Her married name was Hardman. Agnes Featherstone was born circa 1926; She was born on Christmas Day. She married George Hardman, son of Daniel Hardman and Elizabeth Ann Garner, in 1954 at Lowe House Catholic Church, North Road, St Helens, Lancashire. Agnes worked at Beechams. John Hardman was baptised at St Anns Church, Sutton, St Helens, Lancashire. He was born on 4 July 1928 at 75 Peckers Hill Rd, St Helens, Lancashire. Worked at Vulcan as fitter after leaving school. He was a conscript at the age of 18 years. He joined the Royal Electrical Mechanical Engineers (REME). He served in Egypt 1946-1949 at the Suez Canal. He also served in Northern Ireland. When he arrived there he was given a sack and directed to some straw and told to fill it for his bed. He left the army in 1949 and was earning 28s a week at the time. He returned to the Vulcan to finish his apprenticeship as fitter and stayed there until 1955. He used to work two weeks days then two weeks of nights. He also later worked at Croner Taylors. In 1957 he went to work as a fitter at Pilkingtons Top Works City Road. He remained there until he retired in 1982. He married Cathleen Bevington on 20 June 1971 at Lowe House Catholic Church, North Road, St Helens, Lancashire. Her married name was Hardman. Cathleen Bevington married John Hardman, son of Daniel Hardman and Elizabeth Ann Garner, on 20 June 1971 at Lowe House Catholic Church, North Road, St Helens, Lancashire. Elizabeth (Bess) Chaulk was christened on 7 December 1856 at St Peters Church, Great Haseley, Oxfordshire. She appeared on the 1861 Census in Great Haseley, Oxfordshire, and William Chaulk, Mary Thorn, Thomas Chaulk and Henry Chaulk were living in the same household; William the head was described as an ag. lab. Thomas Chaulk was christened on 26 December 1858 at St Peters Church, Great Haseley, Oxfordshire. He appeared on the 1861 Census in Great Haseley, Oxfordshire, and William Chaulk, Mary Thorn, Elizabeth (Bess) Chaulk and Henry Chaulk were living in the same household; William the head was described as an ag. lab. 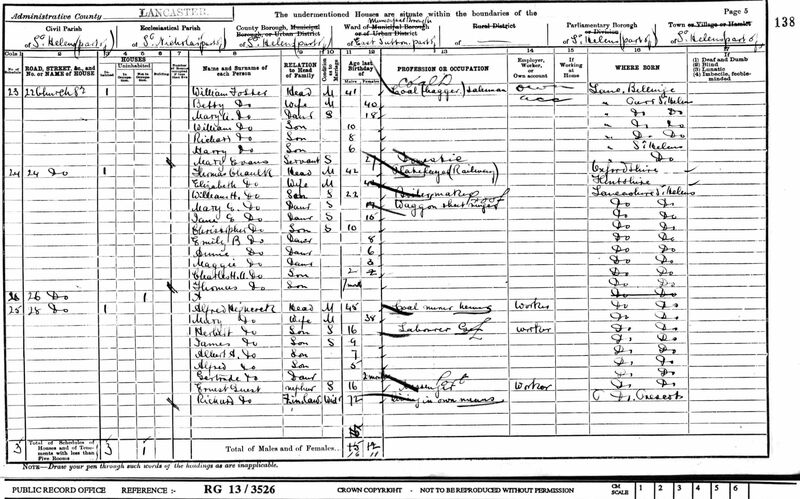 Thomas Chaulk appeared on the 1871 Census in, Little Haseley, Oxfordshire, , and William Chaulk, Mary Thorn, Jane Chaulk, Alice Chaulk, Ellen Chaulk and Henry Chaulk were living in the same household; William and his son Thomas were Ag Lab's. Thomas Chaulk married Elizabeth Catherine Williams on 24 June 1878 at, St Helens, Lancashire, . Thomas like all his brothers and sisters was born in Great Haseley but moved to the North West perhaps in search of work. He seemed to move house quite often and there are some years when he can't be found in the electoral rolls in St Helens. In 1881 he was living at 60 Watery Lane, in 1882 he is at Ellamsbridge, in 1884 4 Worsley Brow, in 1888 17 Watery Lane, in 1889 34 Church St, in 1899 24 Church St, by 1910 he is at 104 Peckers Hill Road. Elsie Parsonage was once told that her grandmother (Thomas' mother) had a chip shop at that address. Thomas Chaulk appeared on the 1881 Census in 60 Watery Lane, Sutton, St Helens, Lancashire, and Elizabeth Catherine Williams and William Henry Chaulk were living in the same household; Thomas the head was described as a carter. Thomas Chaulk appeared on the 1891 Census in 34 Church Street, St Helens, Lancashire, and Elizabeth Catherine Williams, Mary Elizabeth Chaulk, Jane Ellen Chaulk and Christopher Chaulk were living in the same household; Thomas was described as a platelayer. Some of the other young children are absent from the address on this census. 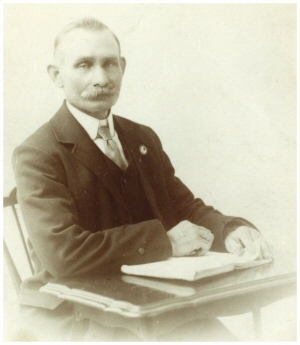 Thomas Chaulk appeared on the 1901 Census in 24 Church Street, St Helens, Lancashire, and Elizabeth Catherine Williams, William Henry Chaulk, Mary Elizabeth Chaulk, Jane Ellen Chaulk, Christopher Chaulk, Emily Blanche Chaulk, Annie Chaulk, Maggie Chaulk, Charles Harold Anderson Chaulk and Thomas Chaulk were living in the same household; Thomas was described as a platelayer (railway), William a boilermaker and Mary a waggon sheet ringer. Marriage* Thomas Chaulk married Elizabeth Catherine Williams on 24 June 1878 at, St Helens, Lancashire, . Her married name was Chaulk. Elizabeth Catherine Williams was born circa 1859 at Bagilt, Flintshire. She married Thomas Chaulk, son of William Chaulk and Mary Thorn, on 24 June 1878 at, St Helens, Lancashire, . Elizabeth Catherine Williams appeared on the 1881 Census in 60 Watery Lane, Sutton, St Helens, Lancashire, and Thomas Chaulk and William Henry Chaulk were living in the same household; Thomas the head was described as a carter. Elizabeth Catherine Williams appeared on the 1891 Census in 34 Church Street, St Helens, Lancashire, and Thomas Chaulk, Mary Elizabeth Chaulk, Jane Ellen Chaulk and Christopher Chaulk were living in the same household; Thomas was described as a platelayer. Some of the other young children are absent from the address on this census. Elizabeth Catherine Williams appeared on the 1901 Census in 24 Church Street, St Helens, Lancashire, and Thomas Chaulk, William Henry Chaulk, Mary Elizabeth Chaulk, Jane Ellen Chaulk, Christopher Chaulk, Emily Blanche Chaulk, Annie Chaulk, Maggie Chaulk, Charles Harold Anderson Chaulk and Thomas Chaulk were living in the same household; Thomas was described as a platelayer (railway), William a boilermaker and Mary a waggon sheet ringer. 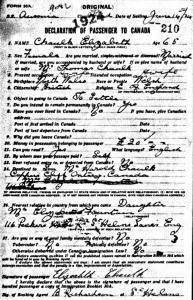 Elizabeth Catherine Williams emigrated on 14 June 1924 from, ; Elizabeth stated that she was married to Thomas Chaulk and that she was going to Canada in order to settle. She had £20 in money and was headed for her's son's home - Harold Chaulk of Coppercliff, Sudbury, Ontario. She gave her nearest family in the UK as her daughter Elizabeth Fountain of 116 Pecker Hill Road, Sutton, St Helens. 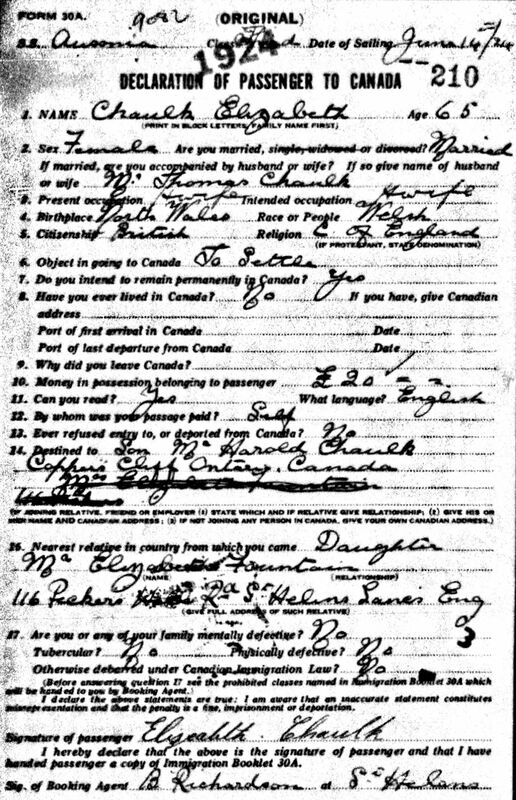 She died on 16 September 1932 at Canada. She was buried at Sudbury Churchyard, Canada. Marriage* She married Thomas Chaulk, son of William Chaulk and Mary Thorn, on 24 June 1878 at, St Helens, Lancashire, . Her married name was Sawyer. Jane Chaulk was christened on 8 March 1863 at St Peters Church, Great Haseley, Oxfordshire. She appeared on the 1871 Census in, Little Haseley, Oxfordshire, , and William Chaulk, Mary Thorn, Thomas Chaulk, Alice Chaulk, Ellen Chaulk and Henry Chaulk were living in the same household; William and his son Thomas were Ag Lab's. Jane Chaulk appeared on the 1881 Census in Manor House, Pyrton, Oxfordshire; Jane was living as a kitchen maid in service in the household of Edward Hammersley, Magistrate for Oxford. There were five other people in service at the household and at the time of the census there were a two visitors, one who was a Lieutenant in the Royal Engineers and the other a Crown Prosecutor from South Africa. Jane Chaulk married Francis William Sawyer on 12 July 1909 at St Peters Church, Great Haseley, Oxfordshire. Alice Chaulk was born circa 1865 at, Little Haseley, Oxfordshire, . She appeared on the 1871 Census in, Little Haseley, Oxfordshire, , and William Chaulk, Mary Thorn, Thomas Chaulk, Jane Chaulk, Ellen Chaulk and Henry Chaulk were living in the same household; William and his son Thomas were Ag Lab's. Alice Chaulk died circa 1872 at, Little Haseley, Oxfordshire, . Ellen Chaulk was born circa 1869 at, Little Haseley, Oxfordshire, . She appeared on the 1871 Census in, Little Haseley, Oxfordshire, , and William Chaulk, Mary Thorn, Thomas Chaulk, Jane Chaulk, Alice Chaulk and Henry Chaulk were living in the same household; William and his son Thomas were Ag Lab's. Ellen Chaulk appeared on the 1881 Census in Great Haseley, Oxfordshire, and William Chaulk, Mary Thorn, Ann Chaulk, Mary (Polly) Chaulk and Alice Chaulk were living in the same household; William the head is described as a carter. Alice is described as grandaughter born Thame. Francis William Sawyer married Jane Chaulk, daughter of William Chaulk and Mary Thorn, on 12 July 1909 at St Peters Church, Great Haseley, Oxfordshire. Ann Chaulk was christened on 25 February 1872 at St Peters Church, Great Haseley, Oxfordshire. She appeared on the 1881 Census in Great Haseley, Oxfordshire, and William Chaulk, Mary Thorn, Ellen Chaulk, Mary (Polly) Chaulk and Alice Chaulk were living in the same household; William the head is described as a carter. Alice is described as grandaughter born Thame.